The event list and schedule for this year’s World Series of Poker has been released by Caesars Entertainment and there are some fantastic events for poker players to look forward to. 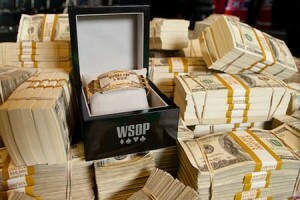 The schedule for this year’s WSOP has been released featuring 65 events including a $10 million guaranteed Main Event. The 45th WSOP will begin on May 27th at the Rio All-Suite Hotel and Casino in Las Vegas. There are sixty-five gold bracelet events and for the first time ever the $10,000 buy-in Main Event has a guaranteed first place prize of $10 million. The Main Event will begin on July 5th with the first of three flights. The $10 million guarantee means that it will be at least the second biggest Main Event grand prize. In 2006 the first prize was $12 million won by Jamie Gold. This year’s Main Event November Nine final table is expected to take place on November 10th and 11th. This year’s WSOP will also include twelve $10,000 Championships for players to pick from including 2-7 Triple Draw Lowball, Omaha Hi-Lo Split-8 or Better, Seven Card Razz, H.O.R.S.E., Seven Car Stud Hi-Lo Split-8 or Better, Seven Card Stud, and Pot Limit Omaha. The $1 million buy-in super high roller Big One for One Drop event will also return this year.